Ga ro-ti, a Vietnamese style grilled or oven-roasted chicken marinated in garlic, soy, black pepper, ginger, and fish sauce, delivers a big flavor punch. Somehow, the soy and fish sauce magnify the chicken’s flavor, rather than obscuring it. A fine meal eaten straight off the bone, this chicken is equally good the next day, pulled and chopped into bite-size pieces and arranged over rice, or rolled inside lettuce leaves with pickled diakon & carrot. Cutting out the chicken’s backbone, aka spatchcocking, prior to marinating & grilling turns bone-in chicken into a foolproof grill item. A pair of poultry shears makes the task quite simpe–start at the chicken’s hind end and cut alongside the backbone until you reach the neck. Repeat on the other side. Flip the chicken over and flatten the breast slightly with the heel of your hand. The de-backboning allows you to cook the chicken inside-down atop fairly hot coals, protecting the breast meat from drying and exposing the thighs and legs to higher heat….an ideal combination for succulent results throughout the bird. 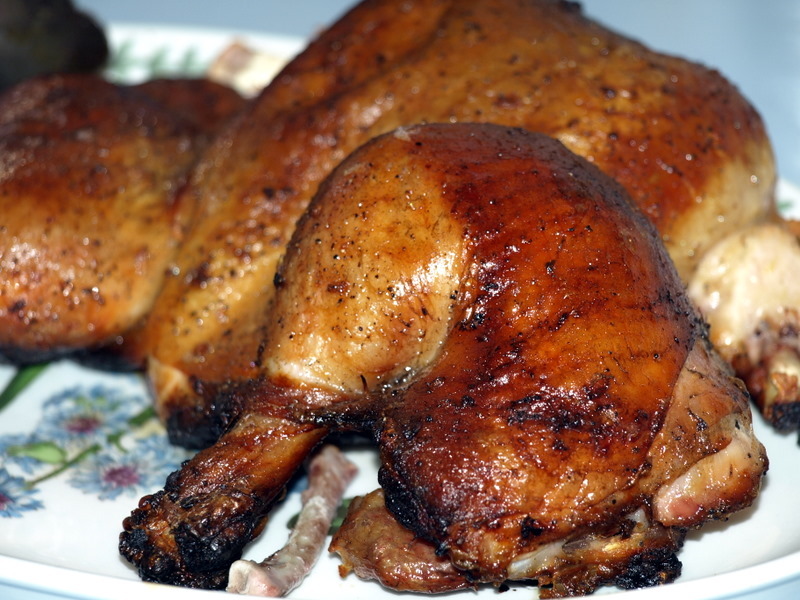 If you’ve struggled to cook crispy skinned, evenly cooked grilled chicken, then spatchcocking will change the way you think about those discounted whole fryers in the supermarket poultry case. Using poultry shears, cut backbone from chicken. Place chicken into a gallon sized zip-top plastic bag. Stir together remaining ingredients and pour over bagged chicken. Refrigerate for 2-6 hours, turning every hour or so to redistribute marinade over chicken. (Longer-marinated chicken will result in darker skin after cooking.) To cook, heat a charcoal grill to medium-high; remove chicken from marinade and place skin side up atop preheated, oiled grill. (On a Big Green Egg, use a dome temperature of 375–400 degrees; direct-cook on a raised grid). Cook for 45 minutes to an hour, or until thigh meat registers 165 degrees. Rest cooked chicken, tented with foil, for 20 minutes before serving. And this is totally unrelated, but I got peter reinhart’s artisan breads every day as a christmas present; the first batch of dough has made two excellent loaves so far. Thanks so much for the recommendation. I really like the super-exact measurements (I already baked with a scale) and that it works well with the kitchenaid. ABED will make a bread baker of you, for sure. The initial “lean bread” recipe is very tasty on day 1, but it stales quickly. His wild-yeast sourdough starter & pain au levain are worth tackling. I decided to make small loaves so we could eat them before they got stale – mom did a lot of bread machine experiments in the early 90s and everything without fat got stale really quickly. Which didn’t stop it being sent as sandwiches. Sigh. My next plan is the slightly less hydrated french bread to try to get better at this whole shaping thing. Then the beer and cheese bread recipe in the back. The lean bread freezes okay (esp as smaller shapes). Defrost at room temp for an hour or so, and reheat in a toaster oven around 250 degrees. I baked a loaf of part white whole wheat, part white, and part flax meal bread yesterday. Did the Lahey no-knead loaf, except I let it rest for 24 hours rather than the prescribed 12-18 hrs. It turned out fine–but only b/c the weather (and thus my kitchen) was on the cool side. It would have been horribly over-risen had I tried a 24-hour room temp rise in July or August. Stale bread equals pain perdu or bread pudding, not sandwiches! For the schedules I work these days the fridge-delayed rising looks like it will work best-one of the drawbacks to Lahey’s no-knead for me is that the windows of time are not that convenient. Making dough one evening and baking it the next evening is about ideal. 12-18 hours is like, well, no, I have to work mid-day tomorrow and get home at 7pm. I need to get Clay in on shaping breads for those days. Gorgeous color on the chicken skin and I like the flavors in the marinade. And you are right about spactchcocking, it’s the best for cooking the meat evevnly though.